It was a decade of flapper fun, economic prosperity, jazz, and celebration. There was a reason it was called “The Roaring Twenties“: WWI had just ended and the country was looking forward to enjoying life. The decade was also famously known for the first ever feature-length film with sound, “The Jazz Singer.” Movie-watching had become a popular source of entertainment and an excellent method of escape for the war-tired nation. However, how we experience movies today is nothing like how the public experienced movies back then. Movie-watching was an extravagant theatrical outing – set a ways away from class divisions, social hierarchies, and the mundane frivolities of daily life. 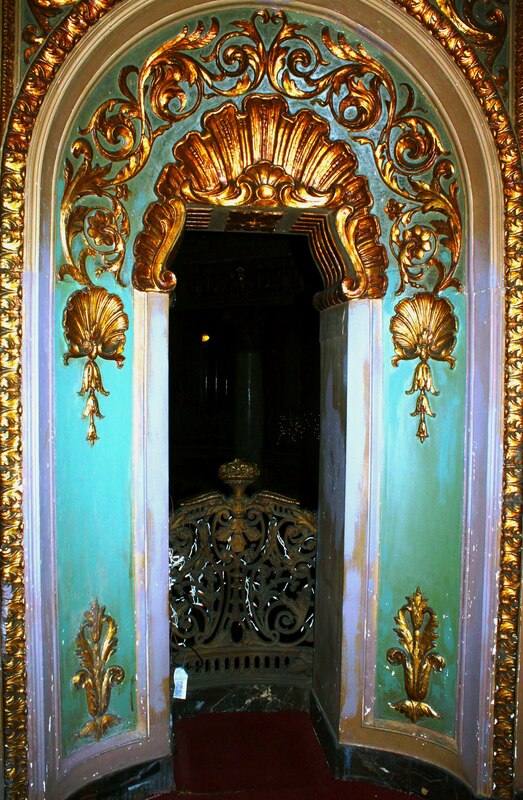 Theaters were not casual cinemas like we have today but, instead, were lavishly decorated and required formal dress. They were quite appropriately branded “movie palaces” (“Picture Palaces” in the UK). Don’t ever underestimate the power of your feet and your mind. H.G. Wells may have built a time machine, but I got by on feet and imagination alone. The pair can take you anywhere (After all, they took Frodo all the way to Mordor & Alice all the way to Wonderland). With that thought in mind, my co-worker, Stephanie de Ruiter, and I went sniffing for history. 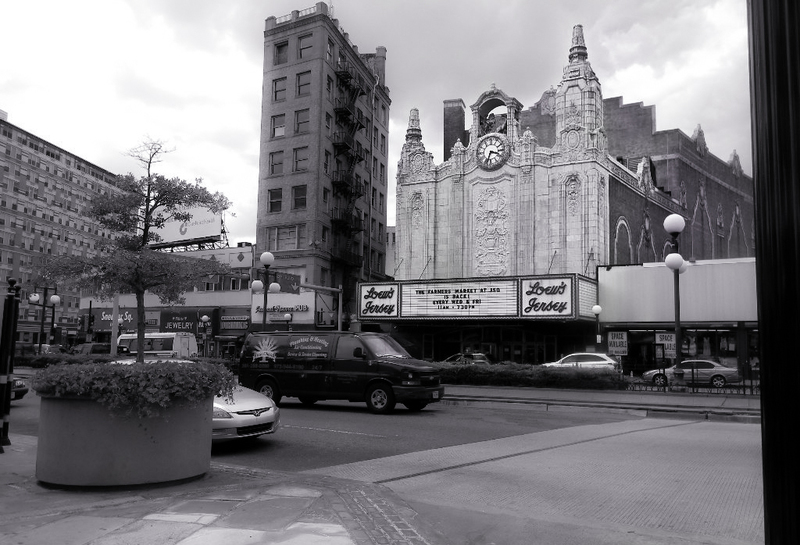 We landed up at 54 Journal Square in Jersey City, NJ – the entrance of one of Jersey’s few and finest movie palaces – The Landmark Loew’s Jersey Theatre. At first glance, the theater seems old and ravaged by history and time but, at the same time, it is completely new – contrasted against the unrestrained digital age we now inhabit. Strangely snuggled between Journal Square Pub and C.H. Martin department store, the theater looks bizarrely out-of-place, almost invisible to passersby. The street was buzzing with noisy cars and silent strangers rushing past, none of them giving the theater a second glance. Although temporarily closed for renovations, event coordinator, Pattie Giordan, and director, Colin Egan, were nice enough to give us a full tour (& some fantastic first-hand accounts about the theater’s tumultuous past). One can’t explain the sense of awe when walking into the main lobby (it looks more like a ballroom). As Stephanie and I walked past the theater’s golden engraved doors, we were transported back eighty years. 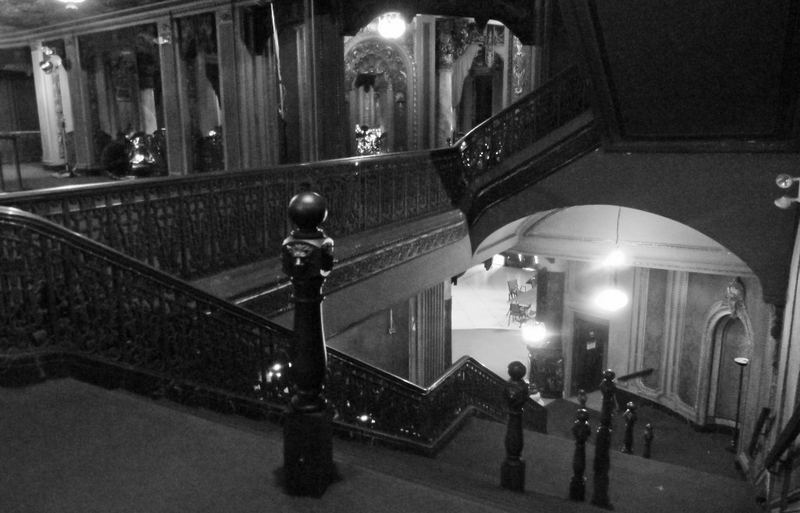 The room is a vast and extravagant space of high ceilings, grand pillars, velvet draped curtains, and 2 gorgeously engraved wooden staircases, laden with red carpet, leading up to the second floor balcony of the theater. 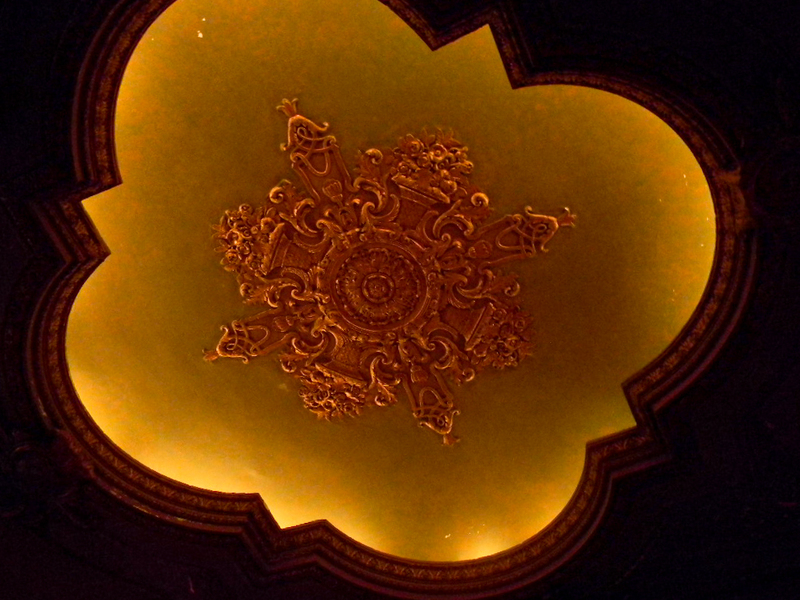 And to top it off, hanging down from the center of the ceiling was a large, glittering chandelier. After WWII and much economic hardship, many movie palaces were being shutdown. Miraculously, The Loews Jersey managed to cling onto life till the mid-1980s, but its doors were closed in August of 1986 and demolition was scheduled in April of 1987. However, the real story lies with the “band of preservationists” that weren’t willing to let the theater go so easily – Patti & Colin being two of them. 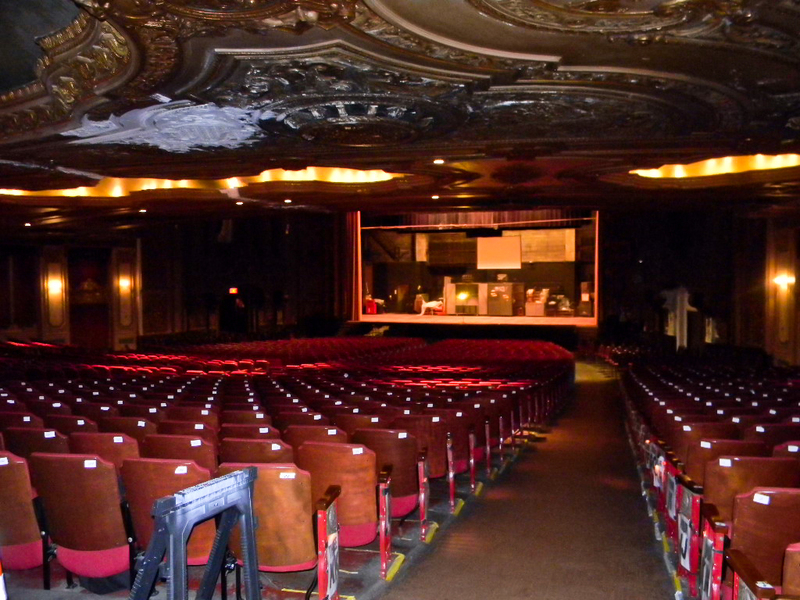 “A six-year crusade” had begun by a group of passionate residents who affectionately called themselves “Friends of the Loew’s.” In the six years that followed, through fervent protesting, petitions, public speeches, and small productions/screenings at the theater itself, the group was able to remind the community of the theater’s value. 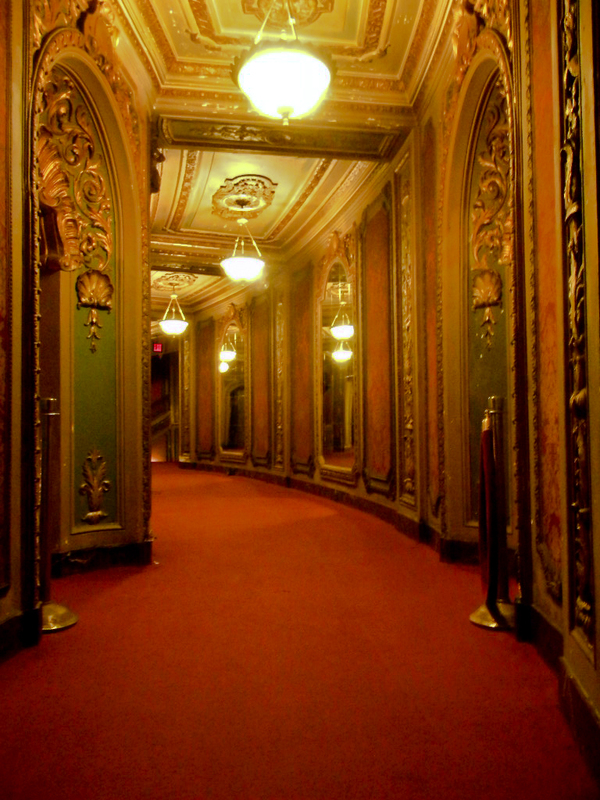 The theater was bought by Jersey City and renovations have been ongoing ever since. Director, Colin Egan, says his finest memory after their success was not his own elation but that of the community’s. He recalls the theater’s early stages of renovation where there was no running water or electricity and the lobby was cluttered with portable toilets & small shelves. He remembers residents walking into the theater, and, upon seeing activity inside, excitedly shouting, “you put it all back!” Colin explained, “We cleaned it, we lit it better, and we made people notice it.” For the Jersey City area, and for Colin and Patti especially who themselves stated “it’s a passion, not a job”, it is apparent that the theater is not just a theater; It is a labor of love and a symbol of the community’s history. They were lucky enough to be part of an impassioned group of people who reminded the city that history is meant to be valued, not forgotten or destroyed. Stephanie and I were also lucky enough to see the rest of the theater as well (which fits about 3,000 people). 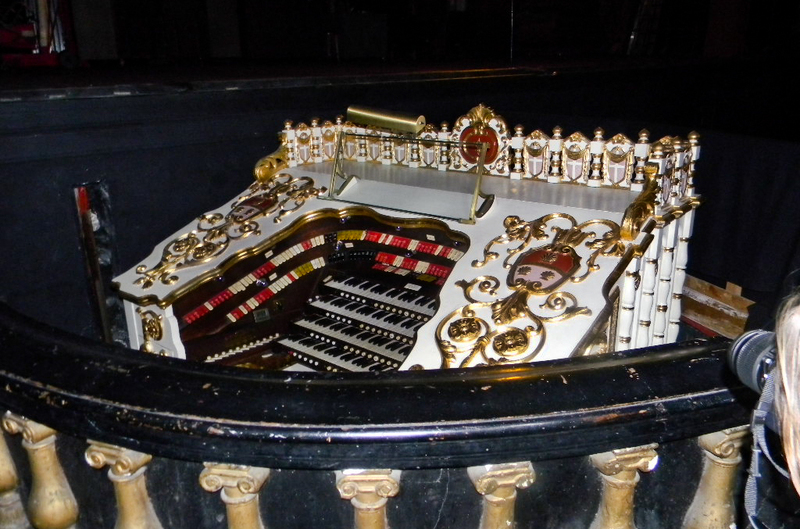 The theater is equipped with its own pipe organ, which has actual instruments built into it in order to make sound effects. The organ is an identical “sister organ” of the original which was removed in the 1970s (see photo below). 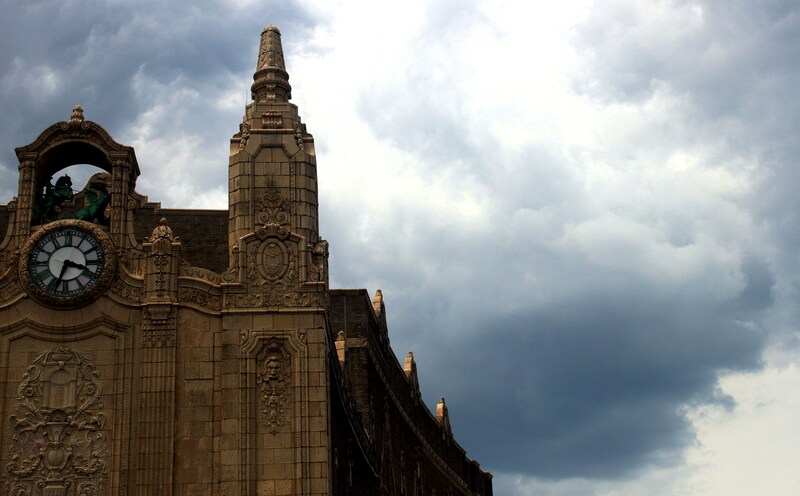 Aside from the incredible aesthetics, the theater also boasts quite the celebrity lineup of performances including Duke Ellington, Judy Garland, and Bob Hope to name a few. 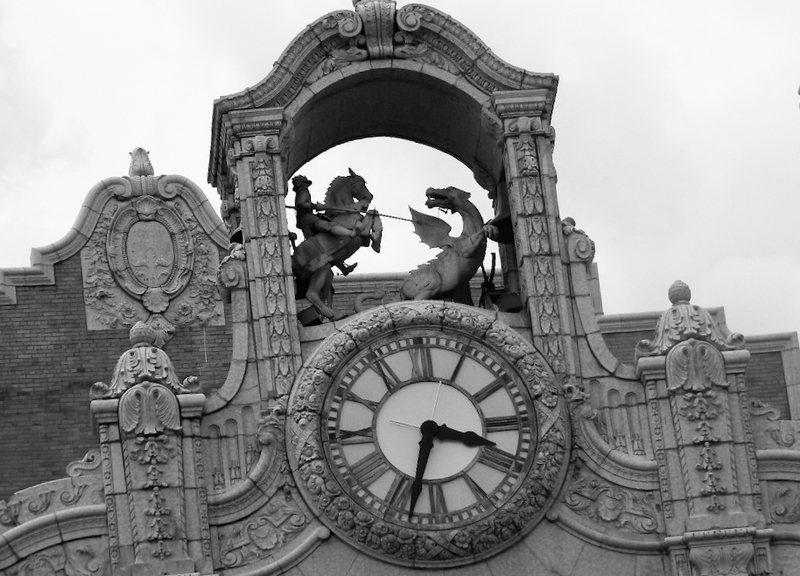 And, if that wasn’t enough, the theater also has its very own clock tower featuring Saint George & the Dragon (more info), that actually lights up in red and moves on the quarter-hour! Although not as grand and pristine looking as the theater once was when first opened, the evident age that shows on the surfaces of the building give it character and gravitas – its own history and age etched into the walls of the movie palace. The theater started out as a place for the community to enjoy entertainment, talent & company. More importantly now, the theater serves as a reminder that what was once forgotten and nearly destroyed isn’t always lost. And with just a few brave voices that care, it can be remembered again. Special thanks to: Colin Egan (Director) & Pattie Giordan (Event Coordinator). Stephanie de Ruiter: An ambitious & rising freelance journalist & photographer – Follow Stephanie on Twitter at @stephascopee!! 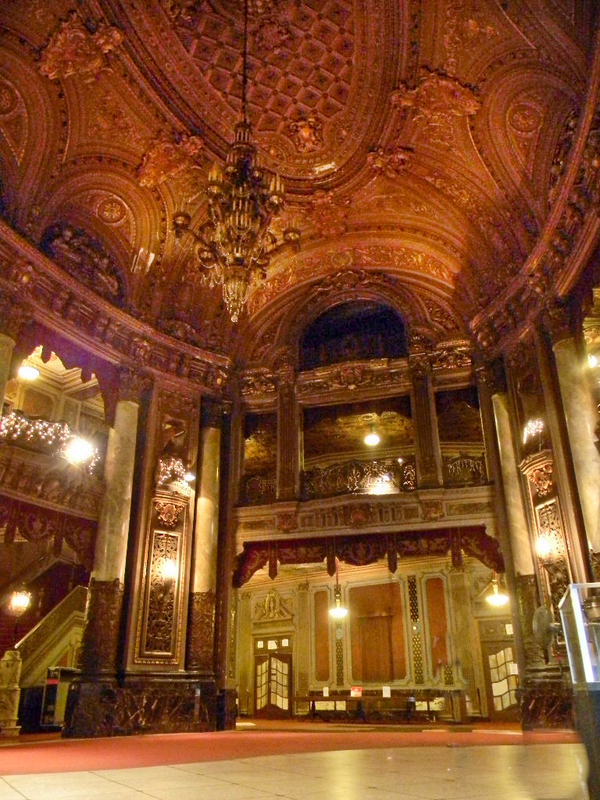 Check out more about the theater here: The Loews Jersey Theater – If you live in the area, it’s well worth a visit and they often have music and screenings on weekends! There was some interest in my last post regarding the discovery of Richard III’s body in relation to the archeological dig and the locations of Richard’s death and burial site. So, I decided to do some digging myself and I found (surprised I didn’t find it earlier) the University of Leicester website that chronicles the journey of the dig week by week: University of Leicester, Archeology. If you have the time and are interested, take a look because it’s definitely an insightful read, not just in relation to the discovery of Richard III’s body, but also in relation to the modern-day process of archeology. The site explains specific details of the dig such as how they pinpointed the locations of the dig as well as the necessary steps that are taken before the dig starts & the trenches are dug – do you know what a “ground penetrating radar survey” is? I didn’t either until checking this out. What’s more surprising is how much “digging” I had to do to find this information. Most articles referencing the discovery of the body mainly discussed the moment of discovery itself rather than the process behind it. I went through article upon article from sources such as BBC & CNN without a single detail about the exact location of the dig – just a vague reference to “a car park in Leicester.” (Of course, I was guilty of that myself in my last post =p ) However, considering the search for the bones was three years in the making, I think it is valuable to know how much work and attention to detail went into it. Someone asked me where exactly the bones were found in relation to the battle site so I came up with a few maps with some help from The University of Leicester. 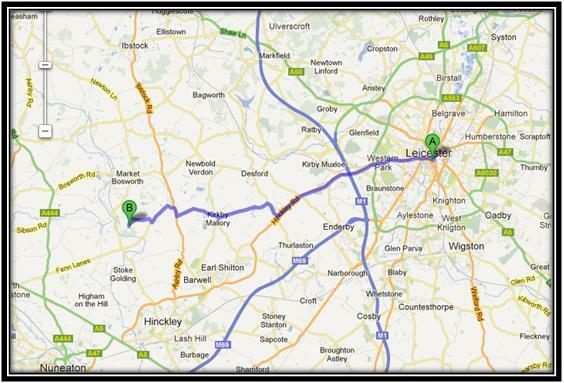 One map is from the Leicester website and the other two are google maps. Keep in mind that these are modern-day maps and these may not pinpoint the exact location of, for example, the Battle of Bosworth Field, but they do give you a general idea. 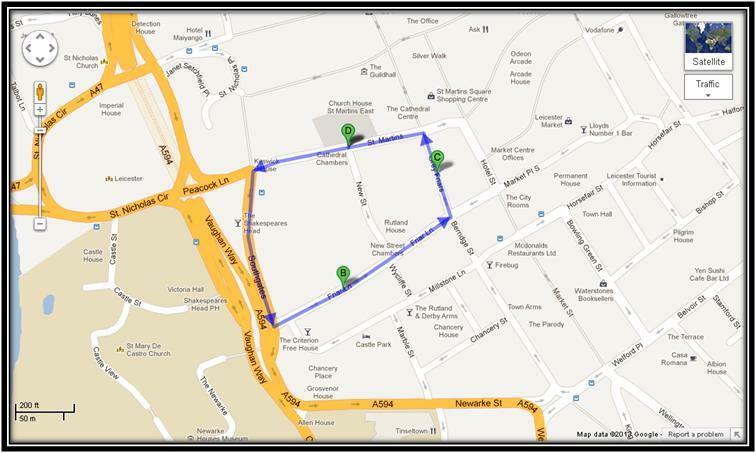 The archeological team did “conduct a desk-based assessment of the Greyfriars area, using old maps and documents to trace the development and use of the land” to identify potential areas where the body may be buried (University of Leicester). 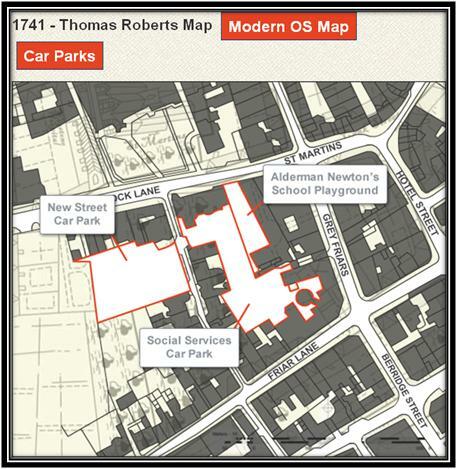 1741 map with modern day map and location of the car parks (dig site area) superimposed. If you live in the area and have some free time, check it out – feel free to send me any photos/interesting stories! History, it seems, is in question. That being said, can the Ricardians rewrite history? And, more importantly, should they rewrite history? As head of the University of Leicester’s School of Archaeology and Ancient History, Professor Lin Foxhall, states, “Our archaeological research does not tell us anything about the character of Richard III, and of course his physical condition and appearance were not a manifestation of his character” (CNN). Although it is a generally accepted fact that Richard III’s historical reputation was indeed subject to much slander and exaggeration by The Tudors (whose reign followed that of Richard’s) and by Shakespeare himself, it would be far fetched to say that “Richard’s skeleton somehow vindicates his historical reputation” (CNN). Even if one were to absolve Richard of the murder of his nephews, there is nothing to say of the fact that he illegitimized his nephews’ claim to the thrown and then proceeded to steal the crown for himself (CNN). Although Richard III may not be the villainous man as represented by The Tudors and Shakespeare, he is still an infamous character in Medieval English History. With this historic discovery, it will be interesting to see what comes of a more open-minded reassessment of the monarch’s reputation. Villain or victim, we can all be certain of one thing: the dead never stay quiet. It seems clear that, after having spent five centuries lost underground, Richard III had a bone to pick with history. I’ve been smoking from the fields of laze everyone. Yup – I’ve recently been found guilty of laziness. And the worst part of it all: it’s impacting my blog. This is my first post in TWO weeks! It’s not surprising – with technology, everything from our offices to our homes has been infiltrated with the silent stench of laze. And we are all victims. That means you too. Smoking laze isn’t all bad however – you get to sleep in (which I do on weekends anyways), eat a lot (which I do anyways), watch Netflix and YouTube like a champ, you don’t worry about the sad state of your productivity and, depending on your laze intake, you subconsciously fall into a wonderfully satisfying doze past midnight. All in all, it’s a warm and fuzzy state of mind…..until you realize you have no purpose to your life. Is there a cure? A 12-step program for this dangerous addiction? Can it be stopped? The answer is yes, but it’s not easy. It’s a day-by-day process and it has to be done or you’ll be stuck with the laze funk. Today is Day 1 and I am laze-free. 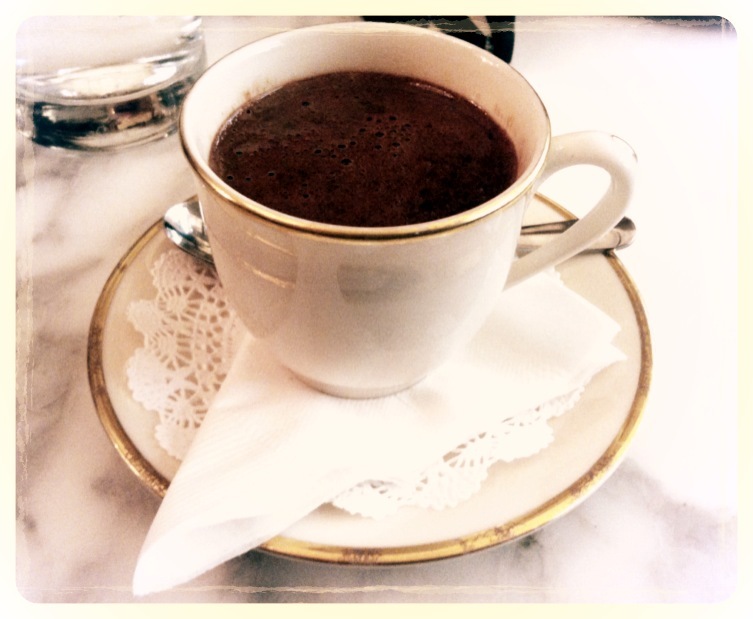 I’ve got two job apps lined up, this blog post is a go, and, well, some more thinking to do. BUT, be wary of a relapse – one productive day doesn’t award you a laze break for a week (be warned: laze side effects include extensive time & memory loss). Your reward is maybe an hour (or two) of T.V., eating, sleeping, mindlessly staring into space, yelling at your spouse or whatever it is that you like to do with your free time. Because, it’s important to have direction, not necessarily a destination, but a direction to travel in – the knowledge that there is movement and, as a result, progress in our lives. Otherwise, life is at a standstill, and you’re stuck at the movie theater, watching your own show reel. Time is important. You can do a number of things with time – waste it, watch it pass by, rewind it, or, move with it. I’ve blogged before about the excitement in examining the past, but that’s not to say the future isn’t an exciting prospect. Sometimes having a good dosage of laziness is good for the soul – helps us put life into perspective, see what we’ve accomplished or just to sit back and enjoy what we have. But looking ahead is also essential – helps us discover new ideas and new places to venture to. So here’s to keeping one foot behind and one foot ahead with a little bit of laze in the middle. PS: My daily dose of laze is a cup of tea (chai to be exact) while surfing the web. What’s yours? It may seem random but it’s mine: Cobblestone Streets. There’s no doubt about it – I LOVE cobblestone streets. I love their uneven nature, their disproportionate looks, their splashes of color (even if faded by time), their romantic European charm and, most importantly, the fact that no single stone is the same. Historically, cobblestone streets date back to the Roman empire and stretched all the way into the 19th century where they were reduced to a standard size of 4 inches – not for the comfort of humans but, instead, for the increased comfort of horses (so let’s not flatter ourselves). It was later in the 19th century, for the purpose of better drainage and with the invention of the car, that most remaining cobblestone streets were sadly paved over with asphalt. However, as with anything in life, the less there is of something – the more valuable it is. 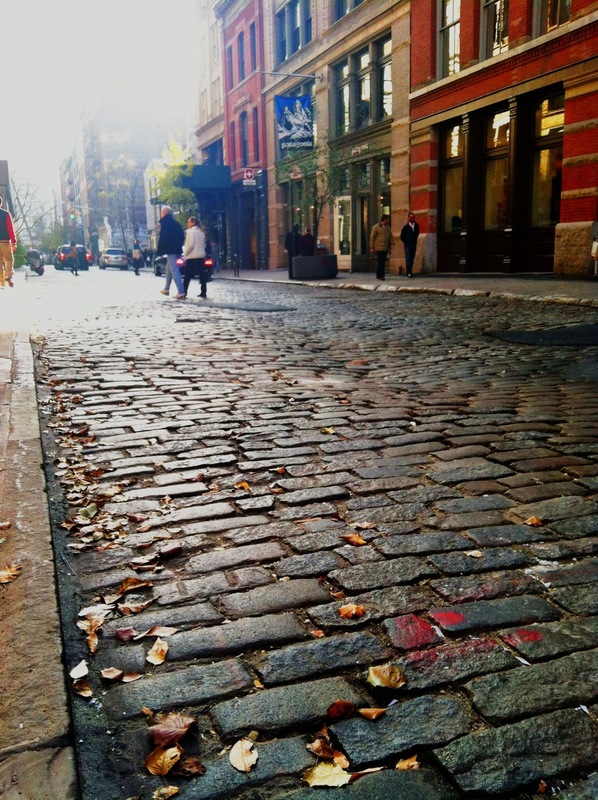 So, this Thanksgiving, while walking through Soho’s many alleyways, I was thankful for cobblestone streets. And, despite the fact that they may have been made for the convenience of horses – my love for them remains in tact. Soho. NYC. Photo taken by me. The East Coast has gone back in time and I’ve been wearing extra thick fuzzy socks. No, not for Halloween-I‘m talking about power outages and no heat. The culprit: Sandy. Hurricane Sandy swept through the East Coast in the USA and, sadly, took a lot with it, including my romantic fantasies of the past. 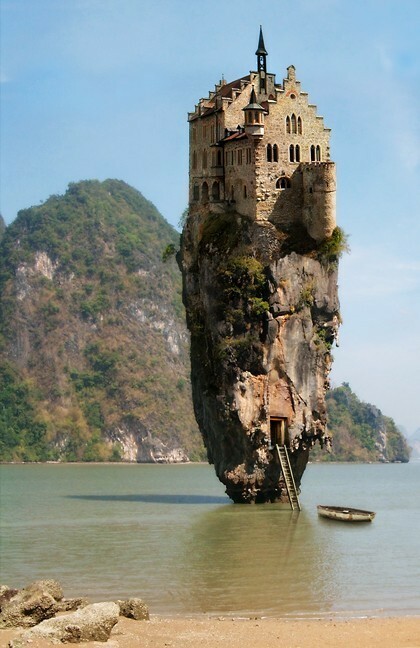 As much as I would like to deny it, my frail demeanor wouldn’t survive two days in cold, medieval, castle-adorn Europe. Forget about the plague, war, and famine – I’m talking about COLD and lack of electricity. The idea of sitting in a cozy bed, warmed by heating pans while reading by candlelight and staring out an arched castle window is all very romantic in my head. But, having fearfully clambered up my house’s dark staircase, armed only with candlelight and wrought with visions of bumping into a an even more deranged manifestation of Freddy Krueger for the past two days, I welcome the 21st century with all its lights and technology and talk of an impending robot revolution with open arms. I like my comfort – I enjoy it. Generally speaking, I do enjoy my occasional fanciful thoughts about medieval life (being dressed in lavish gowns by maids every morning, playing archery with Robin Hood, eating dinner at the Roundtable, and learning how to sword fight) but I often forget about the many downsides of medieval living, like being born into a peasant family or bathing once a month or no internet. While agonizing over these kinks in my fantastical visions of the past, I realized that we often romanticize what we do not know or cannot perfectly recall. We almost always fill the holes of uncertainty and ignorance with positive ideas of heroic acts of valor or mysterious novelties that make us happy or hopeful or nostalgic or whatever we may desire at that instance. Not that this is anything new: some past so-called “heroes,” historic events and even our own personal memories have been distorted by the passage of time and our own desire for feeling good. This calls to question: how valuable is the truth? And, is it possible to have completely unbiased, factual information? Living in the dark ages for the past few days helped me come to a certain realization: Sometimes, the idea is better than the reality. But, to what extent does this matter? After all, ideas are a source of inspiration as well as hope. I never honestly believed that living in medieval times would genuinely be romantic (may be a little), but my ideas of those times and of the past in general offer me a method of escape as well as an appreciation for what I do have right now (like heat, electricity, and internet). Sandy may have demolished my romantic fantasies of castle ridden medieval life, but, while wearing my extra thick fuzzy socks and researching castles and their history on the internet, Sandy has taught me an important lesson: Remember the past and enjoy its novelties, but don’t forget about what you have in the present either. PS: I’m not sure if extra thick fuzzy socks would be readily available in medieval Europe.